Zion Market Research has published a new report titled “Performance Fabrics Market by Type (Coated Fabrics, Polyamide, High-Tenacity Polyester, Composite Fabrics, Aramid, and Others), by End-Use (Industrial, Defense & Public Safety, Construction, Fire-Fighting, Automotive & Aerospace, Sports Apparel, and Others), and by Application (Water Resistance, Stain Resistance, Abrasion Resistance, Fire Resistance, UV Resistance, Anti-Microbial, and Others): Global Industry Perspective, Comprehensive Analysis, and Forecast, 2018–2025”. 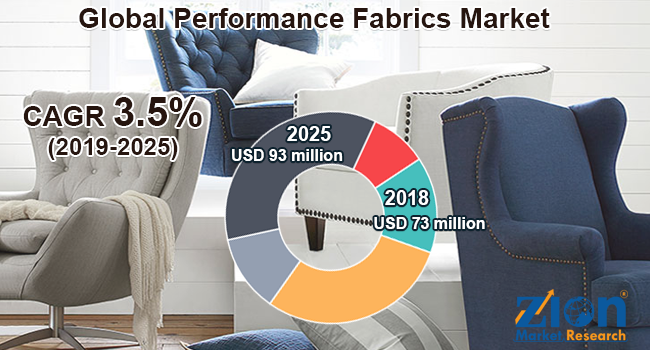 According to the report, the global performance fabrics market was valued at approximately USD 73 million in 2018 and is expected to generate around USD 93 million by 2025, at a CAGR of around 3.5% between 2019 and 2025. Performance textiles are special fabrics that are produced and manufactured for a variety of applications. This particular type of textile provides added benefits, such as waterproofing, stain protection, odor detouring, flame resistance, anti-bacterial protection, body temperature heating or cooling, etc. The global performance fabrics market is likely to experience high growth in the future, owing to the expanding construction sectors, awareness about worker’s safety, and increasing spending on healthcare. Performance fabrics are widely used in various industries for safety and to tackle extreme working conditions. The rising demand for workplace safety and stringent government regulations regarding worker’s safety are projected to enhance the application of performance fabrics in these sectors. Moreover, rapid industrialization around the world has increased the implementation of stringent industrial safety regulations, which will increase the demand for protective clothing, thereby, boosting the performance fabrics market growth in the years ahead. Based on the type, the global performance fabrics market is fragmented into coated fabrics, polyamide, high-tenacity polyester, composite fibers, aramid, and others. Coated fabrics are expected to dominate the global market in the future, owing to the growing use of rubber-coated fabrics to produce military wear and protective clothing. By end-user, the market is categorized into industrial, defense and public safety, construction, fire-fighting, aerospace and automotive, sports apparel, and others. The industrial segment is expected to dominate the global market. The rising awareness regarding labor safety and an increasing number of government regulations are expected to boost the performance fabrics demand for protective clothing in oil and gas, mining, and construction industries. By application, the market includes water resistance, UV resistance, stain resistance, abrasion resistance, anti-microbial, UV resistance, and others. The stain resistance segment is likely to dominate the market in the years ahead, as performance fabrics are resistant to spots and stains, water, soil, and food and fall under the category of stain-resistant fabrics. North America held an extensive share of the global performance fabrics market in 2018, due to the rising adoption of coated fabrics owing to the rising consciousness among the population regarding personal health, hygiene, and fitness. Coated fabrics are coated with various materials, such as plastic resin, rubber, elastomers, and fluoropolymer (PTFE or Teflon). Europe is expected to show modest growth in the global performance fabrics market in the years ahead, owing to the region’s flourishing textiles and clothing market as the regional manufacturers are gaining financial means and momentum to attract top-level researchers, enabling them to explore and exploit the potential of new technologies. This is the primary factor responsible for the growth of the European performance fabrics market. Some key players operating in the performance fabrics market are Topweaving New Material Tech, Sunbrella, Owens Corning, Omnova Solutions, Spradling International, Novustex, Royal Tencate, Koch Industries, Hexcel, La-Z-Boy, Linz Textil, Sigmatex, Milliken & Company, Glen Raven, W.L. Gore & Associates, NMG China, Dupont, and STI, among others.